I changed my mind about making marshmallows with honey after a reader’s comment. Rather than respond immediately, it took me four days (!) to reply, because I wanted to speak from experience and know for sure that honey would indeed work as well as agave nectar. In my response, I also acknowledged that maple syrup could work, though I’ve yet to try. When I do, I imagine that I’ll surely be doing another marshmallow post. Egads! Is there any other food blog out here that has more than one marshmallow recipe? If you didn’t know me better, you might think I had an obsession with marshmallows. After experiencing success with one thing, it feels odd to go back to the same thing and starting over or making slight changes to it – this goes for anything, not just marshmallows. And with going back to something one has had previous success with, one can only hope that whatever is being done differently will work again – those were the thoughts swimming through my head as I watched the mercury rising. This recipe is almost exactly the same as the last marshmallow recipe, except the honey replaces the agave syrup, and I threw in a few new instructions and tips that I learned and incorporated since last time. Like the marshmallows sweetened with agave nectar, these marshmallows are also refined sugar-free and corn syrup free. This recipe makes a smaller amount than usual, but I kind of quail when I see a full cup of honey in a recipe. Most times, I think it’s too much – the only times I’ll use one cup of honey is if I’m doubling a recipe and that’s even roughly so: I may not exactly use a full cup. The marshmallow takes a bit longer to thicken and set, so that means you’ll be mixing it longer (instructions are written for doing it by hand, although by all means use your stand mixer if you have one) but it will thicken. These marshmallows seem to spatter a bit, even as they thicken – in this case I recommend wearing an apron or pinafore to keep your clothes clean. Keep calm and whisk on. 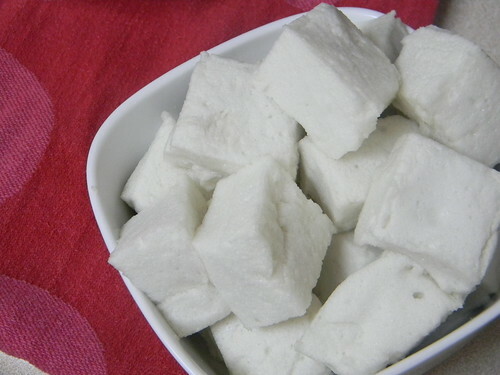 For these marshmallows, if you’re following SCD, coat the cut marshmallows with toasted coconut if you want or have as is. Note: these marshmallows don’t seem as durable over the heat of a flame or fire. I’ve not yet personally tested it, although a comment from Debbie says that turning the marshmallows while roasting them helps. Chill a large mixing bowl and a balloon whisk in the freezer for a few minutes, or longer. Cook the half the water (1/4 cup), honey, and salt over medium heat, covered, for 3 minutes. Increase heat slightly to bring it to a gentle boil and cook until it registers 200ºF on a candy thermometer. While the syrup is cooking, soften the gelatin over the remaining 1/4 cup of water in the chilled bowl. Pour the syrup slowly into the softened gelatin, whisking gently. When all the syrup is poured in, increase your speed and mix vigourously. It will start frothing and soon become white, although it will still be thin. Keep whisking and it will gradually thicken. At some point during mixing, as the marshmallow gets thicker, you may wish to switch to a smaller balloon whisk for better dexterity and ease of control. When the marshmallow has reached a stage similar to smooth, soft peak meringue, add the vanilla extract and whisk for about a minute or two longer. It won’t be as thick, initially, as the agave nectar-sweetened marshmallows. Scrape the marshmallow with a rubber spatula, preferably flexible, into a small square 6″ by 6″ pan or dish lined with wax or parchment paper. Spread evenly. Cover pan with plastic wrap and wait until fully set (if it’s a hot day, storing it in the fridge may help). To test if it’s set, touch the surface with your fingertip: it shouldn’t stick to your finger at all, without marshmallow left on your finger. When the marshmallow is set, turn out on to a plate and use a length of dental floss to cut into squares. You may also use a knife for this, but the dental floss will ensure more smoothly cut marshmallows. Enjoy! Could it be possible that these look even more awesome than the last? I feel behind – must make marshmallows soon! This recipe sounds wonderful! I love cooking with honey, and I’ll be sure to try this. Brilliant! I can’t believe the honey worked! I made a vegetarian marshmallow recipe last year with egg whites in place of the gelatin, but still used corn syrup…So time to try it again, but with honey. Great idea! Hey Zoe – This is a great recipe! My little 4YO just asked me for rice crispy squares today. I have the rice part – just need some marshmallows! I adopted you this month and I’m really hoping we’ll have time to make these this week! If I have enough nerve I will make them with maple syrup! Thanks for the recipe. any suggestions on how to make it chocolate flavored using cocoa powder? Hi lc, I haven’t made chocolate marshmallows yet but I would use cocoa powder as suggested in this recipe from Chocolate and Zucchini. After the marshmallow has been whipped as directed in my recipe, add the vanilla and the dissolved cocoa powder. Oh, this is great! I have made marshmallows in the past but this year needed to remake my recipe using honey. I am SO glad to find you have already done this and shared your experiences! Thanks a bunch! Love your site! Has anyone tried to roast them over a campfire? Do they just melt and fall off? I am desperately seeking a corn-free recipe that will work for camping. Thanks! Hi Sara, thanks for asking! I haven’t had the opportunity to toast these marshmallows over a campfire but I don’t think that they’d melt and fall off. They’re firmer and not as squishy or fluffy as regular marshmallows made with refined sugar and corn syrup. Good luck! My boys tested these in the campfire and they said you have to turn them while cooking or otherwise they will melt. They will brown if you do it right. Hope this helps! these were fun to make but did not work at all over a fire. That is to say, they began melting before they were really warm. 😦 very sad. Anyone had any luck with homemade marshmallows over a fire? Hi Lana, I’m sorry to hear that. I’ve made these marshmallows several times before but haven’t toasted them over a fire or any other heat source so far. The structure is different than homemade marshmallows with refined sugar and corn syrup, which is probably why they started to melt before they were toasted. Made these and they turned out fantastic! I was a little intimidated because I had never made marshmallows before, never mind by hand, but it wasn’t hard at all! Just a little bit of an arm workout. They seem to be setting well, and the “fluff” tasted great! Thanks for the recipe! Hi Danielle, that’s wonderful to hear! I’m so glad. Hi Raisha, you sure can! 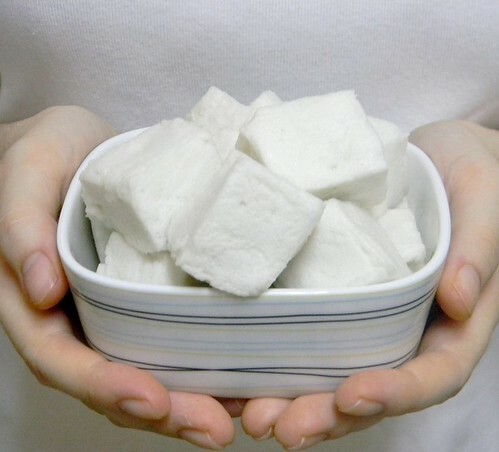 Since this recipe is modified for those who are avoiding refined sugar, you may also wish to look at other marshmallow recipes that do use sugar (including powdered sugar for dusting). Good luck! I saw Brittany’s recipe for Organic Marshmallows on Real Sustenance, and then I saw your link for the honey sweetned ones, which I must say BOTH look so yummy! Have a question, do you think this would work with coconut nectar?? Cant wait to try these! Hi Jaime, thanks! I haven’t tried using coconut nectar for these, so I’m not sure but you could experiment with it and see how it works. I’d love to know how it works out, so do let us know if you try. Just made these & are setting in the fridge. I was actually looking for an eggless fluff recipe when my extensive search led me to a forum which had a link to your blog. I love that your recipe is allergy friendly, has only 5 ingredients and easy to follow instructions! Clean up was a cinch, too; no sticky mess here. (((Z))), thank you for sharing. I would be so grateful if you could give me ideas on how to make this into fluff.